53" x 53" x 82"
A revolutionary built-in wireless scale allows you to weigh products and wrap them at the same time. This greatly reduces time spent moving items to and from different warehouse locations. The stretch wrap machine is completely automatic, and reduces the potential for workplace safety violations. Choose between manual and automatic wrapping modes. Convenient photo eye assists in proper function and helps maintain full functionality. Unit is easy to install. 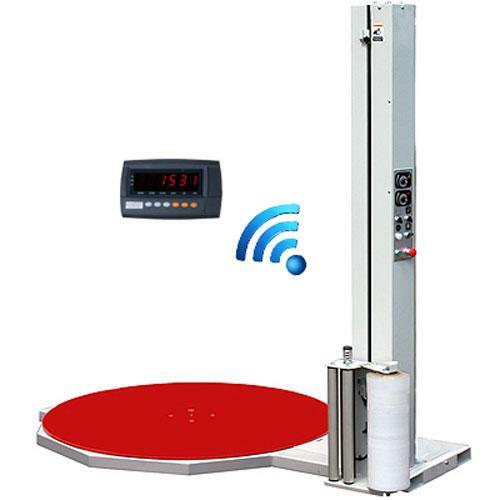 This is a must-have for any warehouse that requires weighing and wrapping machines. It is capable of handling heavy weights – up to 4000 lbs, and it is easy to operate. If you want to improve your overall efficiency rate as well as the professional quality of products you deliver, the SWM-301 can help you achieve those goals. Load Size : 53" x 53" x 82"